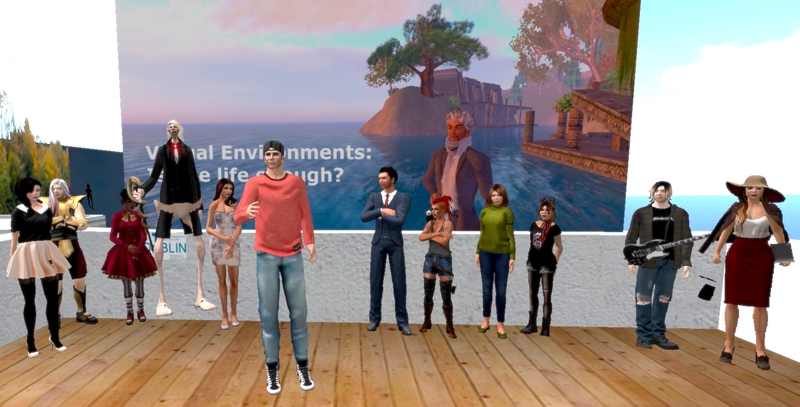 class meeting | Virtual Environments: Is one life enough? Welcome to ‘Virtual Environments: Is one life enough?’ and to Second Life for the first class! It has been noticeable in recent years that participants are navigating digital environments with greater ease and as a class you have demonstrated that definitively. Well done. For those who may be having difficulty logging into SL or finding your way about please talk to your colleagues for advice and help. After everyone settled down John and Locks Aichi introduced themselves and went through some housekeeping. We all added each other to our ‘friends’ list. This enables you to see when participants login to SL and you can send an instant message (IM) to each other when you are in different locations – very handy if someone gets lost in SL. John also added you to the DIT Module group and asked that you activate that group when joining the class. Think of it as your student card: it will give you access to DIT in SL. John also ensured that he knew everyone’s real identity – an important issue online where avatars and aliases allow us to present anonymously. John explained that class will be interactive and discursive. Each week we will look at a different topic, introduced by a set text that you are asked to read before the class so as to inform the debate. It is important that everyone participates fully and engages to get full benefit from attending. You will also need to visit SL between class times to complete activities that will be set to encourage exploration. Specific activities will be set for the first few classes to get you started. You were all asked to create a new blog for the duration of the course. You will be expected to write a weekly post describing your experience of the class and the discussions and activities in which you engage. If you keep this habit and post weekly you will avoid the burden of having to write a complete paper at the end of the module. John also explained that you will divided into groups next week to work on a project which will be presented at the final class of the semester. You are encouraged to read through the pages listed in the right hand column of this website to get full details of the project, see examples of previous student blogs and get an idea of what to expect in the rest of the course. We discussed what communication platform we should use to support the class. It should be one that most people use already so you are not having to introduce something new. It also means that as you are using it regularly messages about the class are less likely to be missed. Previous groups set up private Facebook groups and used twitter and LinkedIN. Other options include WhatsApp or Tinder. Think about it and we will decide next week. You will each receive L$300 to allow you experience the economy in SL but, don’t get too excited, it is only equivalent to about US$1. Visit some shops and markets to find out how the economy functions. If you want to earn more, see if you can find a part-time job in SL. Set up your blog: using blogger, wordpress, tumblr or any other blog site. Complete the ‘About Me’ page (read some of those pages on other blogs first) and remember it is different from the first post on your blog. Write from the perspective of your avatar: the persona you will be using to explore in this module. Email a link to your blog to John. Write the first post: to your blog about your expectations for this module – what you hope to get out of it, what you think you might contribute, etc. Address the relevance of module objectives from your perspective, ie, justify why you think they are important to you. Look at: John O’Connor’s blog and Dreamscape Diary bearing in mind what you learned today compare your own blog writing to this. Visit the following: Dolce Merda, Brain Pickings, Illustration Friday, Chris Brogan, Style Pantry Think about how you would identify these blog authors…what impression do you get of the person behind the blog? Well done to both groups – each one made a very good presentation. The content was well researched, clearly written and coherently presented. Although the slide presenter didn’t work you were able to adapt to the low-tech replacement and it didn’t impede your delivery. One group did somewhat better with the illustration while the other group were clearer about their sources. Overall, a very good effort. Your final assignment (as described last week) is to write a post to your blog giving a critique of your presentation. You should also include the text, references and images from your presentation. Thank you for taking part in the module and for your excellent attendance and engagement. I hope you enjoyed it as much as I did and that you found it a useful introduction to online collaboration. The final class before students present their group project work next week agreed to a slightly later start time of 8.30 pm on May 19th. John gave students a notecard with details of how to prepare slides for the presentation. If you have any questions about the project please post them to the Facebook group and John will endeavour to answer as soon as possible. Remember that the blogs will be due for assessment next week also. Make sure you complete all the required posts and follow the guidelines and feedback you have been given throughout the module. The deadline for completing your blog is midnight Friday 20th May – they will be assessed sometime after that. Read: 5 Steps to Build a Productive and Tight Knit Remote Team. Write the tenth post: to your blog after you have made your presentation next week. Describe how you think the presentation succeeded and where it could have been better. Comment on what you learnt about online collaborative working. Class started with a discussion about the feedback on student blogs. We had some clarification on what ‘writing more reflectively and critically’ means. Earlier this month John suggested you read the advice given to a previous class: Blog posts and group work. If you haven’t already read it you should do so now. John asked each group to provide an update on how the group project work is progressing. It seems that it hasn’t really gotten going properly yet. Nobody took the opportunity to meet in Second Life during last week’s class time. Some participants have been discussing the project in Facebook and both groups are planning to meet over the weekend to begin work. Following a discussion about the topic of the project where it became clear that students had not really considered the scope of the project John suggested that an extension of the presentation date by a week (from 12 May to 19 May) might be a good idea – it is justified on the basis that last week’s class was cancelled. It was agreed that students will post to Facebook on Monday giving their preference regarding the presentation date. John also proposed that the presentations be delivered where we meet for class using the slide viewer there. Each group can use up to 10 slides in its presentation. There was a general discussion on the topic of the project: what our workplaces are likely to look like in 2050. Using McLuhan’s suggestion that we consider how technology influences behaviour we pondered growth of online and virtual systems. History is always a good jumping off point. Would anyone in pre-industrial Europe have expected industrialisation to result in unemployment? It would probably have been inconceivable to people who starved if they didn’t work. The expectation that replacing workers with machines would lead to a golden age of leisure for all did not come to pass either. How likely is it that people will still be going to offices and factories for work by 2050? These questions should form the start of the project brainstorming exercise. Teams are expected to be asking the right questions rather than producing the right answers. Use the readings set throughout the module to inform your thinking and make sure you refer to it in your presentation. John also reminded you of the importance of reflecting on your teamwork in the context of the talk on team work last month and writing up your thoughts in your blog. Meet: in your groups to plan your approach to the project, decide on what aspect of the project you will explore, identify the individual tasks and prepare an outline schedule (this work was to have been done for today’s class but wasn’t). Write the ninth post: to your blog describing how your team considered the Form-Storm-Norm-Perform aspects of team work and how you addressed the various team roles. For online collaboration to lead to successful outcomes it is useful to have an understanding of how teams function. We considered the under-lying factors that influence groups and teams in real life and discussed how they might apply in the online environment. Then we examined the various roles different members of the team might play over the life-cycle of a project. You can review Sitearm Madonna’s tips and tools for online virtual collaboration and team working. John reminded everyone of the importance of reading the project brief carefully and also paying particular attention to the assessment criteria. There is no value in working hard on something that is not required – ensure your focus is sharp and your effort is actually contributing to the required outcome. You should re-read both the brief and the assessment criteria regularly throughout the project to ensure you remain on target. From here on your blog posts will concentrate on the development of your team and the project, referring to the principles and guidelines outlined in the class. Reflect on how these play out in reality as you work together – describe what works well for you and also the difficulties and problems you encounter and how you resolve them. Pay particular attention to what you are learning, noting how you might do things more efficiently and effectively in any future team work. Ensure you document your contribution to the project. As there is no formal class next week John advised that you use the time to meet in your groups in SL and get a good start to the project. You all know how difficult it can be to arrange a suitable time to meet outside of class (everyone has lots of commitments) so use this opportunity to kick start your project and settle on a working methodology that suits the members of your team. John will arrange an alternative class time through now the Facebook group. Meet: in your groups to plan your approach to the project, decide on what aspect of the project you will explore, identify the individual tasks and prepare an outline schedule that will see you ready to present your work on May 12th. Write the eighth post: to your blog describing this meeting, your contribution and your team plan.